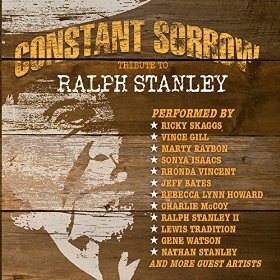 An interesting selection of mainly country artists pay tribute to the legendary Ralph Stanley, in a project helmed by his grandson Nathan. Stanley’s son Ralph II opens with the Celtic-sounding ‘Katy Daly’, II’s naturally melancholy tones counterpointing the upbeat tune about a 19th century moonshiner to enjoyable effect. Nathan takes on ‘A Robin Built A Nest On Daddy’s Garden’, which is also very good. Stanley’s old bandmate Ricky Skaggs sings the traditional ‘Gathering Flowers For The Master’s Bouquet’. Jeff Bates sounds like a real bluegrass singer on ‘I Think I’ll Just Go Away’, a lovely old Stanley Brothers lost love tune. Lovely – I’d like to hear a full bluegrass album from Jeff. Rhonda Vincent is beautiful on ‘The Darkest Hour’, another highlight. My favourite track, though, is Vince Gill and Rebecca Lynn Howard duetting on an authentic and compelling murder ballad, ‘Pretty Polly’. Insofar as Ralph Stanley has a signature song, I’d say it would be ‘O Death’, which he sang on the movie O Brother, Where Art Thou. The great Gene Watson offers a powerfully intense reading here. Marty Raybon gets the now-iconic ‘I Am A Man Of Constant Sorrow’, and does a nice job, partnered by Sonya Isaacs. Southern gospel duo (and real life husband and wife) Jeff & Sheri Easter perform ‘Going Up Home To Live In Green Pastures’, and The Lewis Tradition (a spinoff from/second generation successor to Sheri’s mother’s family band the Lewis Family) offer a pleasant traditional four part harmony on ‘Dad’s Ole Rocky Field’. Harmonica whiz Charlie McCoy gives a70s outlaw country-meets-bluegrass twist to ‘Little Maggie’, which works surprisingly well. ‘Room At The Top Of The Stairs’ is a haunting Randall Hylton song about a lonely woman who refuses to believe the protagonist can offer the love she longs for. I remember it fondly from Kieran Kane’s 1993 solo album Find My Way Home. I hadn’t been aware of Ralph Stanley’s version, and Jimmy Fortune’s take made a nice surprise. This is a lovely tribute album: some great singers on excellent songs, with a tasteful bluegrass production backing them. I warmly recommend it. I was thoroughly charmed by Charlie Worsham’s debut single. And keen to see what the young Mississippian would come up with on his first album. the result is interesting. While it’s not a traditional country record, it is a breath of fresh air in the rock and pop environs of modern country radio. Charlie wrote all the songs with a variety of collaborators, many of them with his co-producer Ryan Tyndell. He is a capable rather than outstanding vocalist, with a pleasant, rather light voice, but his songwriting and musicianship are both strong. But the darkness doesn’t last long, as a sunny attitude imbues the song; one feels quite confident that she will succumb to the protagonist’s charms. There is a very youthful feel to the whole record. I very much liked the folky and probably autobiographical ‘Young To See’, about seizing opportunities to experience life. ‘How I Learned To Pray’ is a gentle ballad about finding God through first love which is rather sweet. The more wistful ‘Mississippi In July’ also looks back to his teens and is quite atmospheric in an understated way. ‘Tools Of The Trade’ is a paean to making music, with some star guests: Marty Stuart and Vince Gill, on both vocals and mandolin/guitar respectively, and (billed only in the small print) Rebecca Lynn Howard on backing vocals. It’s a bit heavier sounding than the remainder of the record, but still fairly rootsy. I also liked ‘Love Don’t Die Easy’ and ‘Break What’s Broken’, a pair of low-key ballads, the former with Sheryl Crow on backing vocals. ‘Trouble Is’ is pleasant but unexciting, while ‘Someone Like Me’ is like early Keith Urban, with quite a nicely written wistful lyric. The one track I didn’t enjoy at all was the self-indulgent title track, which is repetitive and nonsensical lyrically, and really just an excuse for some experimental musicianship. While not an essential purchase, this is a very pleasant sounding record with some decent songs. it is very tastefully produced and mixed so that electric guitars and drums do not overwhelm everything else as they do on so many commercial successes. I hope that this more understated and organic sound can find a space on country radio. In recent years Martina McBride has struggled to remain commercially relevant. Having landed only one Top 10 hit in the past seven years, she left her longtime label RCA last year in the hopes of reviving her flagging career. Unfortunately, the move to Republic Nashville has done little to change her commercial fortunes, as it has become apparent that her chart decline is due not to any neglectfulness on the part of RCA, but to her seeming inability to select decent material. She shares co-writing credits on six of Eleven’s tracks, the most she’s ever contributed to a single album, but for the most part this doesn’t result any measurable improvement over her other recent efforts. When an artist ends a long term relationship with the label where she scored her greatest achievements, it can signal a bold new change in direction or a continued long period of stagnation. In Martina’s case, it’s definitely a case of the latter, as Eleven is more or less in the same vein as her last few, very lackluster albums for RCA. Her debut single for Republic Nashville, “Teenage Daughters”, offered a brief glimmer of hope that she might be getting her mojo back, but those hopes were quickly dashed as rest of the album is mostly a relapse back into the bubblegum pop she’s been peddling since 2006. Though not a great song by any means, “Teenage Daughters” showed a spunkier side of Martina, which we’ve not seen in quite some time. Written by McBride and the Warren Brothers, the song deals with the challenges of raising adolescent daughters and was in no doubt inspired by Martina’s real-life experiences. The record peaked at #17. It was followed by what appears to be the intended centerpiece of the album, the God-awful “I’m Gonna Love You Through It”, the most shameless attempt to manipulate the listener’s emotions to hit the airwaves since “God’s Will”. McBride and producer Byron Gallimore were likely hoping for a big power ballad hit that explores serious issues, in the vein of “Concrete Angel” or “A Broken Wing”. The problem is that the lyrics lack any subtlety whatsoever. It’s currently at #19 on the charts, but since most radio listeners really don’t want to hear songs about people suffering from cancer, I’ll wager that this one isn’t going to go much higher. Most of the other tracks on the album, from the opening track “One Night” to the annoyingly sing-songy “Always Be This Way” and “Broken Umbrella” sound like throwbacks to 1970s-era Top 40 AM radio, reminiscent of the poorer efforts of artists like Helen Reddy, The Carpenters or The Captain and Tennille. Despite these considerable drawbacks, Eleven does have its brighter moments. Though not very country, “Marry Me”, a cover of last year’s minor adult-contemporary hit by the pop/rock group Train, is quite pleasant. It is performed with the song’s writer and Train’s lead singer Pat Monahan. The bluesy “Whatcha Gonna Do”, written by Rachel Thibodeau, Rebecca Lynn Howard and Jason Sever also works quite well and I’m guessing that it will eventually be released as a single. And things improve considerably with the album’s last three tracks, “Summer of Love”, “When You Love a Sinner” and the stunningly beautiful closing track “Long Distance Lullaby”, which Martina co-wrote with Mark Irwin and Josh Kear. These three numbers are the album’s best tracks, and serve as a reward of sorts for having persevered through the earlier tracks. Having been disappointed by Martina’s previous three albums, I wasn’t expecting Eleven to be an outstanding effort, and it definitely isn’t, but it’s worth the $4.99 that Amazon MP3 is currently asking for it (the version with digital liner notes is $9.49). A deluxe version with four bonus tracks and three music videos is available exlusively from Target stores. Country radio’s love affair with Patty Loveless began winding down around 1997, with the release of the single “You Don’t Seem To Miss Me”. The record met with resistance by some radio program directors, who requested the release of an alternate version, without the harmony vocals provided by George Jones. Loveless refused to remix the record; it stalled at #14 and she never again had another Top 10 hit. Her commercial appeal may have waned, but freed from the constraints and pressures imposed by radio, Loveless has blossomed as an artist and released some of the best music of her career. In 2001, she released a critically acclaimed bluegrass album, and this week, Mountain Soul II, the long awaited sequel, finally hits store shelves. Though mostly acoustic, the subtle use of some non-bluegrass instrumentation — electric guitar, pump organ, and pedal steel guitar — prevent Mountain Soul II from qualifying as a true bluegrass album, and Loveless and her label, Saguaro Road Records, have been careful not to refer to it as such. In press releases, they describe it as Appalachian, bluegrass, and country combined. Regardless of the label, it is a worthy successor to Mountain Soul, and unlike many sequels, it holds its own against the original. Many of the players from the original Mountain Soul — Jon Randall, Rebecca Lynn Howard, and of course, Loveless’ producer and husband Emory Gordy, Jr. — are back on board this time around. Loveless is also joined by special guests Del and Ronnie McCoury, Vince Gill, and Emmylou Harris. The opening track and lead single for the album is a cover of the Harlan Howard classic “Busted”. Recorded many times in the past by artists such as Johnny Cash, Ray Charles, and John Conlee, Loveless’ version restores Howard’s original lyrics, which contain references to coal mining, rather than cotton farming, referred to in the other recorded versions. The lyrics were originally changed at the request of Johnny Cash, but coal mining is a better fit with the acoustic arrangement and bluegrass harmonies provided by the McCourys. Even better are the vocal performances that the McCourys contribute to the old standby “Working On A Building”, which is the most purely bluegrass song on the album. Gene Watson is one of my all-time favorite singers, and it is good to report that he is still sounding great at the age of 65. Listening to his new album, his second for independent label Shanachie, is like listening to a masterclass in singing country music, a subtle rendering of understated emotion. Gene is not a songwriter, so the ultimate artistic success of his records always depend on finding great outside material, and fortunately he has found some fine songs here from some of the best writers currently in Nashville, which are ideally suited to his voice. The overall theme is one of lost love and regret. In the past where you belong? Just as good is another sad song about failing to get over someone (and obviously not trying very hard), Tim Mensy and Keith Stegall’s ‘Three Minutes At A Time’, as the narrator forgets his troubles for a while by listening to country songs on the jukebox: “it’s heartache in rhyme, but it helps me hang on”, he testifies. It’s always about the song in country music. Whether the writer sings the song or not, a topic Razor X raised last week, the song itself is what everything else ultimately depends on. One of the things I love about country music is the range of subjects it tackles, but the thing most songwriters know the most about is, of course, writing songs. So it should come as no surprise that some writers have chosen to reflect on that process within their work: the nature of inspiration; the way lives and pain are transmuted into art; and complaining about or celebrating the state of the music industry. Self-referential, perhaps – but also a fascinating insight into songwriters’ thoughts about the songs they write. So here are some of my favorite songs on the theme. Some of the most memorable country songs are the ones which surprise you, the story song with a twist in the tale, or the song which suddenly goes in a direction you really weren’t expecting. Sometimes the effect is desigend to make you laugh; sometimes it may bring you to tears; there are some songs which simply stop you in your tracks in shock the first time you hear them. That happened to me the first time I heard the Billy Yates/Monty Criswell song ‘Flowers’, on Yates’ self-titled first album in 1997 (also notable for the first version of the song ‘Choices’, subsequently recorded by George Jones). ‘Flowers’ has also been covered by former Nashville Star winner Chris Young and (with a few lyrical changes) by Australian Adam Harvey, yet even knowing the twist to come, it has never lost its force for me. One of the reasons this song is so effective is that it breaks a lot of the conventions of country songwriting. Instead of the usual verse-chorus pattern, we have a series of hookless verses with the chorus sung through twice at the very end. The title does not appear until the very last word of the song. Rather than spell out the story here, I suggest you listen to the song yourself if you haven’t heard it before (and try to avoid looking at the tags). A surefire way to make the listener cry is to not reveal until late in the song that the subject has died. For instance, Rebecca Lynn Howard and Trisha Yearwood both recorded ‘Melancholy Blue’, written by Harlan Howard and Tom Douglas; in this song the protagonist is wandering restlessly unable to get over someone, but it is presumed that he has just left her until the last verse, when she visits his grave. The vocal is imbued with sadness before that, but the impact on the listener is doubled by being delayed. Even in a song whose subject is as well known as ‘He Stopped Loving Her Today’ (written by Bobby Braddock and Curly Putman) it is only halfway through that it is truly obvious that the reason the protagonist has stopped loving the woman who has left is that he has finally proved himself right when “he said ‘I’ll love you til I die'”. Similarly, although there must always be a sense of looming doom in a Vietnam-era story featuring a soldier, it is only at the end of Bruce Robison’s ‘Traveling Soldier’ (most famously recorded by the Dixie Chicks) that the young man’s death is announced. It is perhaps almost as much of a shock to the listener as to his unfortunate sweetheart. I first heard Alecia Nugent back in 2004, when she released her eponymous debut album. It had some great songs on it, but I must confess that I didn’t really enjoy her singing, which I felt lacked subtlety and verged on the strident. Because of that, I passed on her follow-up in 2006, A Little Girl … A Big Four Lane, and it is only now, with the release of her third album Hillbilly Goddess, that I have rediscovered Alecia. Her singing has improved immeasurably. Her tone has become warmer and fuller, the stridency I disliked has disappeared, and she has developed the ability to sing with subtlety as well as emotion. Carl Jackson’s production is faultless, and the pair of them have picked some very good songs well-suited to Alecia’s voice and style, which is very much in the country-meets-bluegrass vein. There is a gorgeous version of Buddy and Julie Miller’s modern classic ‘Don’t Tell Me’, which is imbued with delicately understated emotion, which is perhaps the best exemplification of how far Alecia has progressed as a vocalist. She gives a beautifully understated reading of Tim O’Brien’s regretfully poetic ‘Wishing Hard’: “Sugar just can’t hide the taste of bitterness that you get from wasting a heart that’s full of love but just can’t show it”. The joyful title track, co-written by Alecia herself with Jackson and Sonya Kelly, is a light-hearted but at heart, deeply romantic, tale of true love, set to a lively up-tempo tune featuring banjo from J D Crowe. The downhome heroine “may not be a glamor queen”, but to her man, she is the eponymous “hillbilly goddess”. The label should try this irresistible song as a single. Emotional truth is at the heart of almost all truly great country songs. There is a very fine line in country music between the true tearjerkers, for which the genre is justly known, and the cloying sentimentality which outsiders sometimes ascribe to the music. Not, I have to admit, always completely unfairly – if the strings are too obvious, the emotion feels forced, and the song just doesn’t work. But as I said, the line is a fine one, and a song’s impact depends on a number of factors. Country music does not consist solely of confessional singer-songwriters, and we do not expect every song recorded to be a personal slice of the author’s life – certainly not when it comes to a love song or cheating song. However, when we are aware a song draws on its writer’s experiences, I think we are more disposed to respond to them as “real”. If a love song is said to be for its writer’s spouse, and the marriage subsequently breaks up (as, for instance, with Vince Gill’s ‘I Still Believe In You’, written for first wife Janis Gill before he left her for another woman), the song may suddenly seem emotionally dishonest in retrospect, purely because the listener has bought into the story behind the song. In the case of a song specifically designed to elicit an emotional response, this authenticity is all the more important. There is a line in the Mavericks’ song ‘Children’ which refers to “a life where everything’s real and nothing is true”. I do not believe a song has to be factually real to convey emotional truth, but it does help to dispel accusations of sentimentality. An example of this would be Tammy Cochran’s ‘Angels In Waiting’. This tribute to Tammy’s two brothers, who both died young as a result of cystic fibrosis, would be cloying if the song were an invented one. It probably wouldn’t even work if it were sung by an unconnected singer, even though it was written from the heart and is a well-constructed song. Here it is almost completely the fact that it is the true story of the person singing it which carries the emotional force of the song. Another instance is Jimmy Wayne, whose first self-titled album was filled with intensely emotional songs inspired by his childhood. These songs — the hits ‘I Love You This Much’ and ‘Paper Angels’, and other less-known numbers on similar themes — would undoubtedly fall in the emotionally manipulative category if they were not genuinely based on Jimmy’s appalling childhood in foster-care. That lends an emotional truth which is not found in the same singer’s love songs which are forgettable. American Idol finalist Kellie Pickler is frankly not a very good singer, but her song ‘I Wonder’, about the mother who abandoned her in childhood, has an emotional resonance, which is lacking in her other material, and is genuinely moving — as long as you know the story behind it is true. I don’t think it stands on its own merits.